Saturday marked the 27th annual Dalziel Festival of Youth Rugby - attracting teams from all over Scotland and beyond. 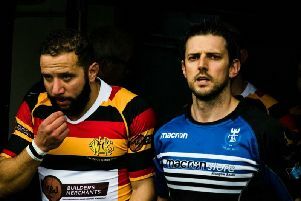 Some 40 clubs, including touring sides from Northern Ireland, participated in the showcase tournament which is dedicated to the memory of late club stalwart, Alan Calder. Among the 1000 players and spectators at Dalziel Park were Glasgow Warrior stars Matt Fagerson and Hagen Schulte along with SRU past president Jim Stevenson. Robert Birch, Dalziel High School Depute Head, and David Waddell of ClubSportNL also joined the guests of honour. Teams from Primary 1 to Under-18 competed for the honours at their respective levels and the prestigious Alan Calder Trophy (for U-18) was won by East Kilbride. Festival Convenor Graham Calder said: “The 27th festival anniversary was only made possible by the huge efforts and hard work of a vast number of people. “The day brings all hands to the pump, from senior players selling raffle tickets to mums baking cakes and committee men flipping burgers. “I’d like to express my thanks to all who helped over the weekend. The winners were: P1/2 Dalziel Dazzlers; P3 Dalziel Dazzlers; P4 Northern Ireland Civil Service Hawks; P5 Hamilton; P6 Hamilton; P7 Dalziel; S1 Livingston; S2 Hamilton; U-15 East Kilbride; U16 Dalziel; U18 East Kilbride. The festival was dedicated to the memory of the man who started it all in 1991, Alan Calder (1949 -2008). Alan formed a strong vision which saw the first youth rugby festival held in 1991. He wanted to introduce youngsters to the sport, allow them to enjoy the game and to include everyone, win or lose, irrespective of their ability. In Alan’s words, which he often repeated, “Young players of today are the backbone of tomorrow’s club rugby”. The event is a lasting tribute to Alan’s commitment, leadership and organisational abilities.